Home » Paid » 100 Coins » MYDEERDOG’s Got Moves! http://www.line-stickers.com/ – MYDEERDOG’s Got Moves! 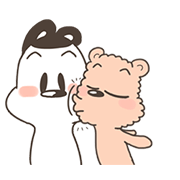 Line Sticker | Flattery is a road of no return. Once you start, you just can’t stop. But sometimes we just need a little flattery in our lives. MYDEERDOG wishes you a happy life with these stickers! All I wanna do each day is touch you, be with you, kiss you, think of you, and tell you how much I love you. Name LINE Sticker: MYDEERDOG’s Got Moves!